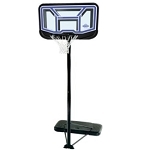 Product: 1221 Lifetime Basketball Hoop - Pro Court Portable Basketball Goal. 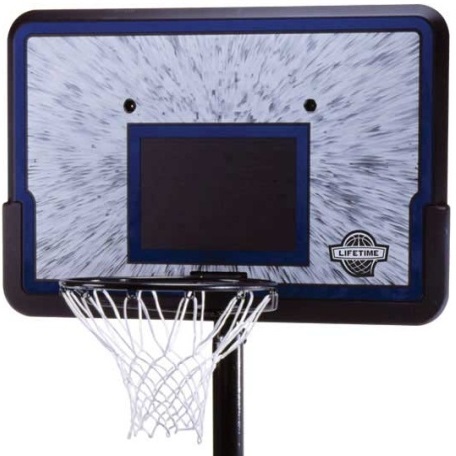 Lifetime portable basketball hoop model 1221 features a strong 44 inch high-density polyethylene (HDPE) plastic backboard and a telescoping pole. This system is great for a beginning basketball player to start learning the game. The rim height is adjustable down to 7.5 feet, which allows young players an opportunity to feel the success of shooting their first swish. Order your Lifetime basketball systems here. 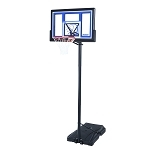 Lifetime portable basketball system with 44" Black Rectangular Impact Backboard Standard, 3 piece 2.75" Round Black Telescoping Pole, Black Classic Rim, Direct Mount Ext. Arms (Similar to 1207 portable basket ball hoop). 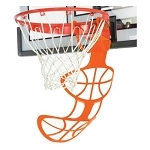 View info about our basketball equipment, hoops, goals and basketball accessories. 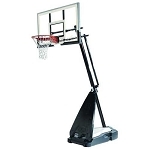 Please see our entire line of Lifetime Basketball systems we carry at Competitive Edge. 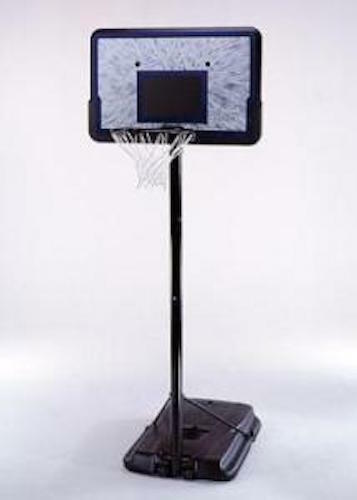 Similar to model 90040 Portable Basketball Hoop. 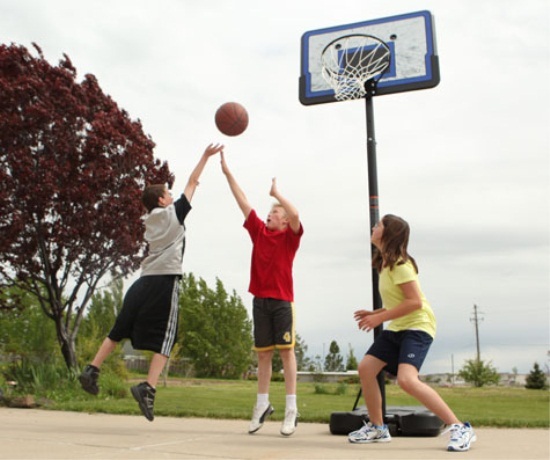 Please also see our entire line of Portable Basketball Hoop systems. This model has a backboard made of polyethylene plastic. This sort of plastic does very well outdoors as it will not fade or crack like traditional plastics. 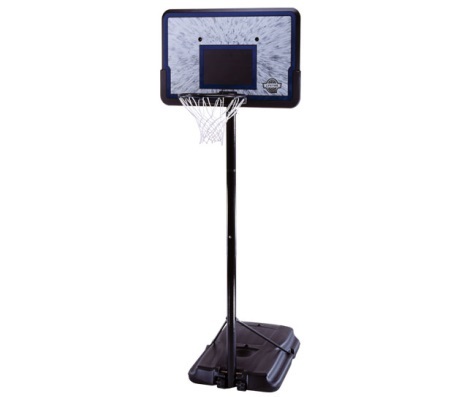 This model of portable basketball hoop is a very basic model and is suitable for beginning players. This basketball hoop is best assembled with at least three adults assisting. Looking for coupons? Like us on Facebook for coupons and updates on new products. 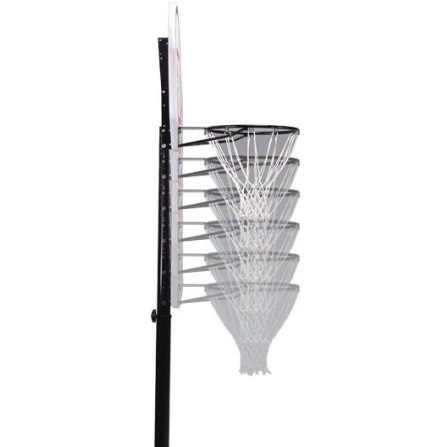 Coupons may be used towards accessories such as pole pads, ball returns, and basketballs. 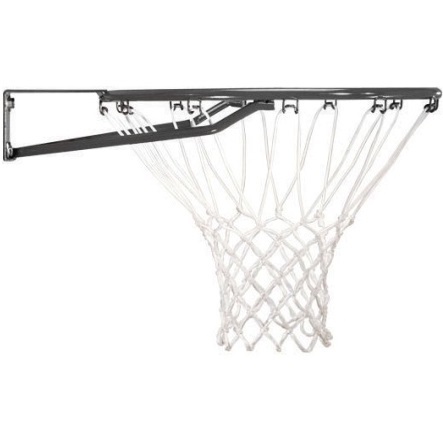 Dimensions: 44 inches W x 28 inches H.
Backboard material: high-density polyethylene (HDPE) plastic. Uses a telescoping pole height adjuster from Lifetime Products. The telescoping pole height adjuster uses a push pin and a pole sliding mechanism to raise and lower the backboard height. Portable base footprint: 43 inches L x 30 inches W.
Pole size and structure: 3 piece, 2.75 inch diameter round pole. Portable base size: 27 gallons. Shipping dimensions: 44.5 inches x 34.4 inches x 7.75 inches. Includes a 5-year warranty on all parts of the system from Lifetime Products. Item as advertised, sent promptly, good communications. Great to deal with, answered questions and shipped product fast! Pros:Stable Base,Quality Construction,Easy To Setup Cons:Difficult To Adjust Best Uses:Residential Use Describe Yourself:Beginner Bottom Line:Yes, I would recommend this to a friend. If you have kids who slam dunk hard or want to hang on the hoop, look elsewhere and prepare to pay big bucks. If you just want to play 21, horse, etc. or have a little one on one without all the slamming, this is a great choice. Assembly was easy except for attaching the hoop and backboard to the frame. Directions said two man job, but we sure could have used a third person. Instructions were clear, all parts were there, and you can save a pdf file of the instructions and parts list Great company in my book. Pros:Easy To Setup,Quality Construction,Easy To Adjust,Weather Resistant,Stable Base Best Uses:Residential Use Describe Yourself:Beginner Bottom Line:Yes, I would recommend this to a friend. This is a great hoop for this price point. I looked around for a better deal and could not beat this hoop. Good solid construction, easy to move, stable platform. Great for the kids and adults. Q: How tall is this? A: This Basketball System Adjusts from 7.5-10' in 6" increments. A: The base dimensions are 43.2 in. x 30 in. x 6.5 in. and it has a 27 gallon capacity. 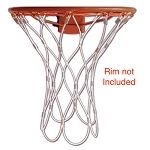 Q: What is the difference between the 1269, 1221 and 90040 lifetime basketball hoops? A: These models 1269, 1221, and 90040 are very similar, the main difference is the backboard type, (rectangular impact or shatter guard fusion) and graphics. Everything else is very similar. Q: How thick is the pole? Q: How big is this? A: It is a 10 foot high Basketball System. Box dimensions before setup are about 45 x 35 x 8. Q: Can I buy a second pole? Q: Can I install a new backboard? A: yes, any of the 44 inch and 48 inch backboards in the lifetime brand would be compatible. Please look at the backboard and rim combo's on our website for more information. A: absolutely, just call 800-225-3865. Q: I don't have a big driveway about how much room do I need? A: You don't actually need a whole lot of room. Some people play on very small concrete slabs or even on dirt. Q: I have to transport this goal a long distance in the back of my pickup. If I separate the extension pole from the pole attached to the base, how long will each piece measure? A: I'm not quite sure, but you can find out by calling 800-225-3865. The pole is about 8 1/2 feet long. Each piece is about 2 1/2 feet long. It can be difficult to get the poles apart. Q: Where can I get a replacement pole? A: You can get it by calling 800-225-3865. Q: I lost the plug/base to keep the water in the base. Where can I obtain a replacement? A: Please call 800-225-3865 for a replacement. 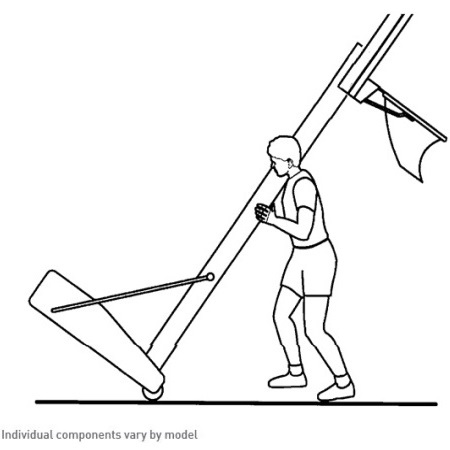 Q: I'm putting together my lifetime 44" basketball goal. However I'm worried that the pole is not correct. The warning label is not in the correct location but the poles can only go together one way. Help please? A: You want to call the 800 number on your owners manual for specific assistance with that particular issue. Their number is 800-225-3865. Q: How high does this system extend to? A: This goes up to the 10 feet regulation height. Meaning, this is designed for adults playing regulation height of 10 feet. It does go down to 7 1/2 feet to allow children to play as well. Q: What is the difference between the 1221 and the 90040 basketball systems? A: The 1221 and the 90040 are entirely identical. Only the backboard graphic and color are different. Fast Shipping: Orders for the 1221 Lifetime Portable Basketball Goal generally leave the warehouse the next business day. Dimensions: 45" x 32" x 9"